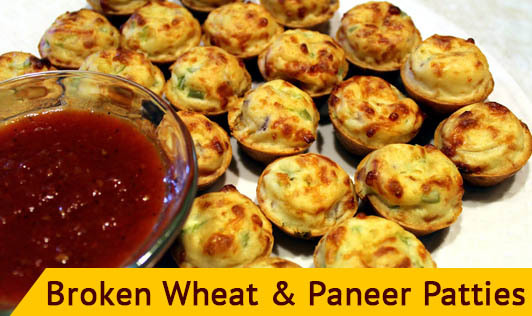 Enjoy nutritious broken wheat and paneer patties with this recipe. 1. Clean and wash the broken wheat thoroughly. Blanch it in 1 cup of hot water for 4 minutes. Keep aside. 2. Combine all the ingredients in a bowl and mix well. 3. Divide the mixture into 8 equal parts and shape into patties. 4. Shallow fry the patties using a little oil on a non-stick tava, cooking on both sides till golden brown in colour. 5. Serve hot with ketchup or chutney.